Wide-awake, I got out of bed as quietly as possible. Tiptoeing into the closet I collected some morning clothes by feeling around in the dark, and then stole away past the door into the moody stairway. I moved at a snail’s pace down the steps making sure not to stumble or awaken Cheryl, who was soundly sleeping, totally unaware of my plan. It was still dark as dawn had not yet broken, so I ventured out the front door with a flashlight in hand to find my way down the steps and out to the studio. Once around the corner, I breathed easy as my silent escape had proven successful. The words were clearly in mind as I sat down at the computer with dim light and a cup of hot tea by my side. In the night a new perspective occurred to me—an alternate approach to the book we’ve decided to write. As soon as my fingers touched the keyboard, I was off and running as the inspiration was strong. I wrote for several hours without stopping. The sun came up, casting shadowy light into the valley and salmon hues onto the clouds above. The morning was beautiful, the new approach to our writing felt right, and I was totally engaged in the process. Sensing that Cheryl was probably up, I decided to take a break and share some of the ideas with her. 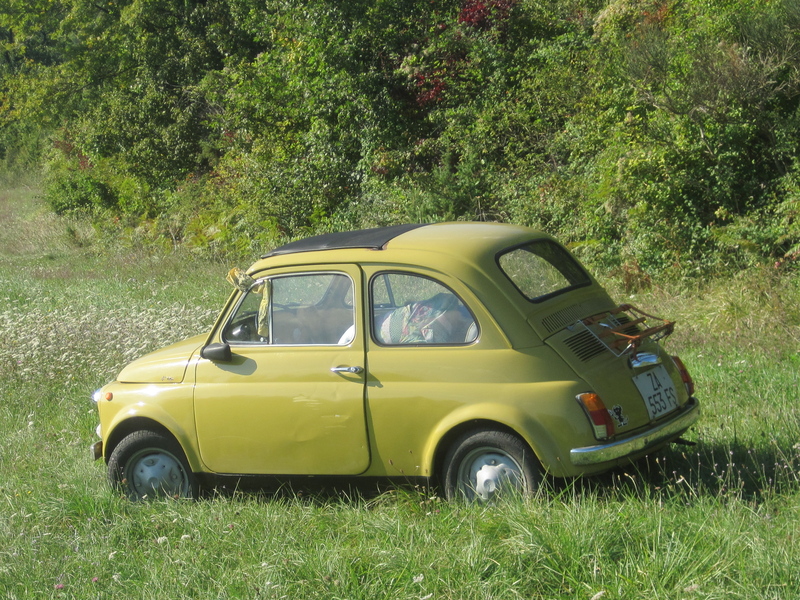 When I walked out of the studio door, there in the meadow below, about 200 yards away I saw a parked car—an ochre colored Cinquecento 500 (say cheen-quay-chento). Now, in case you didn’t see our earlier post, the Cinquecento was the first real Italian town car manufactured by Fiat in 1957. Those that are still running are coveted by any true Italian. The proud owners not only enjoy driving one of these historical gems, but they also find their way into clubs, parades and special touring caravans around the Italian countryside. 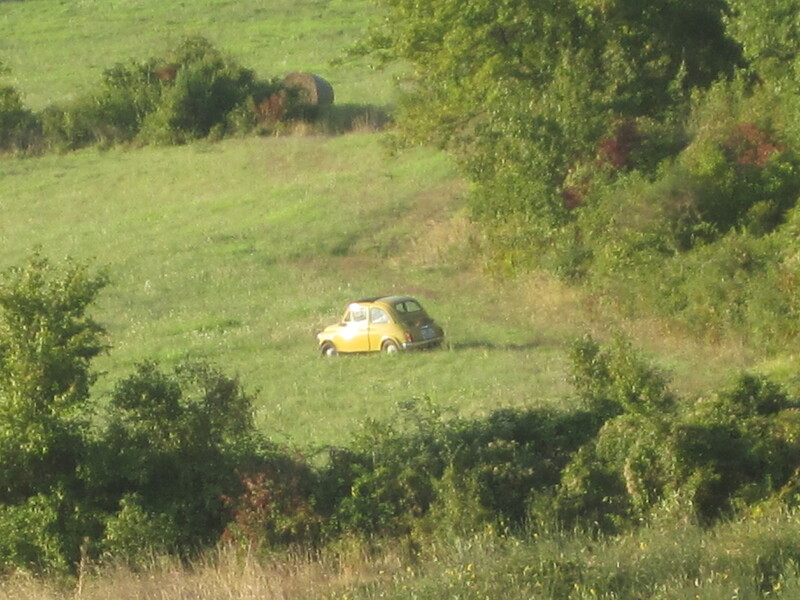 The strange thing about this particular car in the field was the question of how it got there. The only road to that meadow is the old stone road running behind our house, now used strictly as a footpath or farm lane to access the fields. The only reasonable way to go is on a tractor or in some off-road vehicle, but certainly never in a Cinquecento. We wouldn’t hazard that rocky ride in our car, and it’s a far cry from a decades-old Fiat that clears the ground by only about 3 inches. 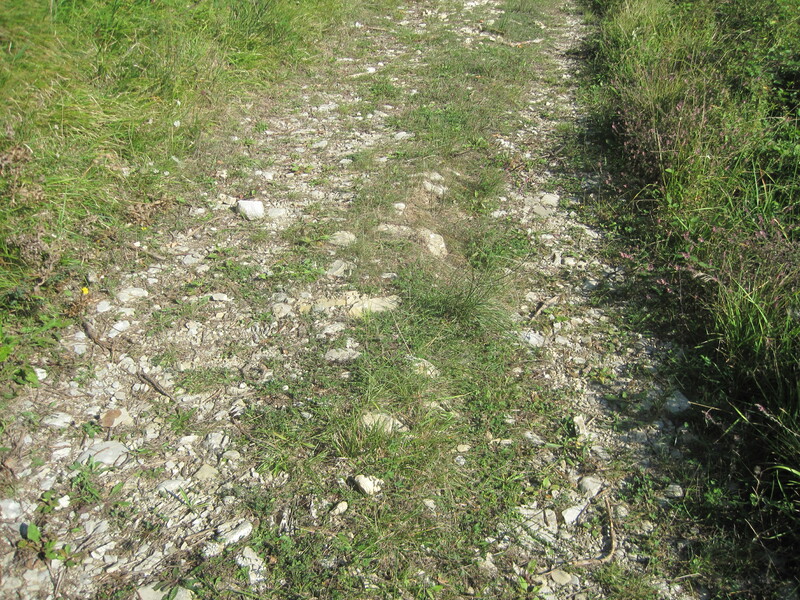 The steep grades alone would be a challenge. 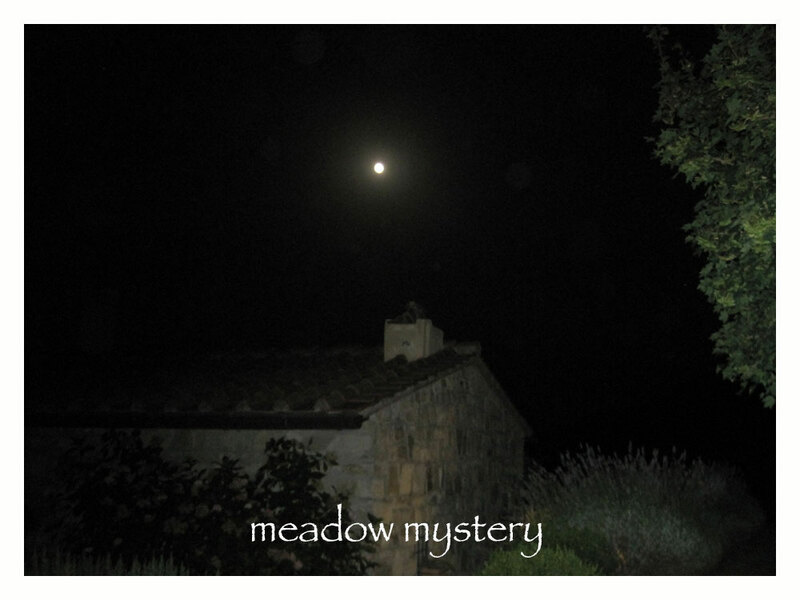 But, regardless of the how it came to be parked at the edge of the field, there it was—like a little surprise package that mysteriously arrived in the night. 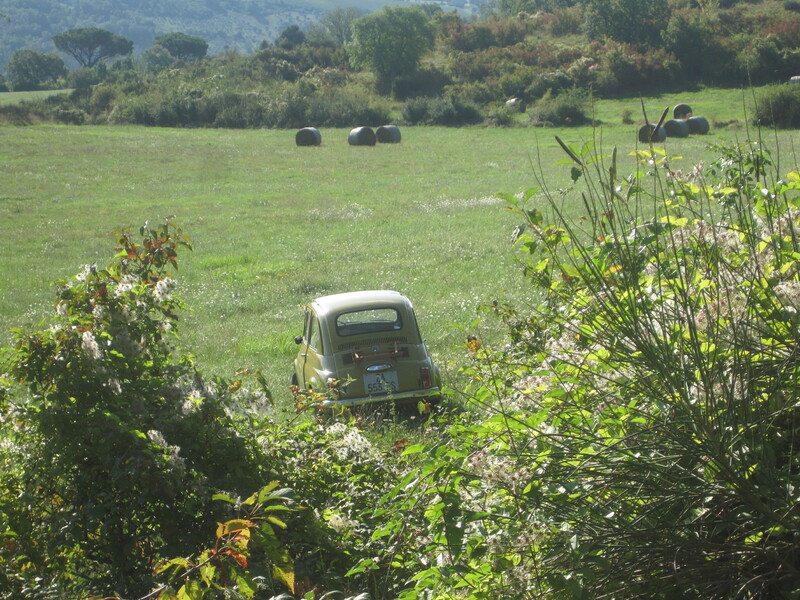 For us, spying that particular car in the field was like the Italian version of seeing a leprechaun. I rushed into the house to get the camera only to find that Cheryl had made the same sighting and had already snapped a few distance pics from the upstairs bedroom window. We both saw the magic and wanted to savor the moment. Life is made up of billions of events, signs, sightings, omens, portents and premonitions. It’s up to each of us to assign the meaning that makes sense to us in our own life. After Cheryl and I talked it over, we decided to stay with the Leprechaun idea as a definitive signal from the universe—that basically we’re on the right track with our book. After all, we make this life up minute by minute anyway, so why not make it as beautiful, magical and irresistible as we possibly can? Why not? I walked down to take a look and upon closer inspection; the car wasn’t all that interesting. There was a man asleep in the front seat. I must admit that it took some of the magic and mystery away. An hour later, he stumbled from the driver’s seat and slept on the ground for a while. Finally, late morning, he got back into the car and motored on up the road in a normal fashion with no difficulty whatsoever. Perhaps he was just sleeping off a rough night in an out of the way place—not much romance in that. Maybe what I wrote in the early hours of the morning wasn’t really inspired by the presence of a wee Italian leprechaun after all—perhaps it was just my vivid imagination weaving its own magic!